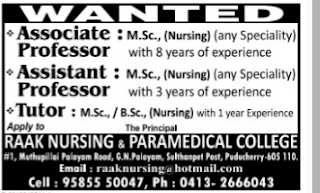 Raak Nursing & Paramedical College, Puducherry has advertised in THE EENADU newspaper for recruitment of Associate Assistant Professor, Tutor Faculty jobs vacancies. 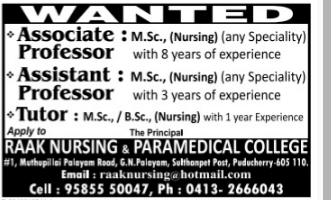 Interested and eligible job aspirants are requested to apply immediately.Check out further more details below. How to apply: Interested and eligible candidates can apply below address.